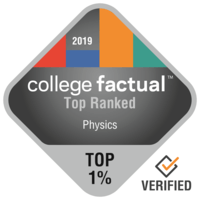 2019 Best Physics Colleges in the U.S.
Just 7,912 students earn a degree in Physics every year, which means it ranks just 58th out of 384 in appeal. Physics students typically earn $50,803 during their early career and $90,575 in their mid-career salary. This is 21.0% more than the standard college grad. In fact, Physics ranks 22 out of 121 college majors in regards to projected salary. The following list ranks the best colleges and universities in the U.S. for a Physics degree. Our ranking methodology takes into account factors such as education quality, average earnings of graduates, accreditation, and several other relevant factors. The top ranked school in the United States for Physics is California Institute of Technology. Graduates of the physics program earn an average of $59,979 in their early career salary and $104,814 in their mid-career salary. Positioned in Pasadena, California, this school is a strong choice for students who enjoy the exhilaration of a substantial city. Massachusetts Institute of Technology is one of the best schools in the United States for Physics. In addition to its bachelor's programs, Massachusetts Institute of Technology offers graduate degrees in Physics. Cambridge, Massachusetts is an ideal area for learners who enjoy the fast-paced city life. Harvey Mudd College is a wonderful option for students pursuing a Physics degree. Physics students from Harvey Mudd College earn a boost of around 27.7% over the typical income of physics majors. The location of Claremont, California, is satisfactory for learners who desire a more tranquil, suburban spot. Stanford University is among your best bets if you're planning on studying Physics. Stanford University offers graduate degrees in physics for those interested in an advanced degree. Based in Stanford, California, Stanford offers a dependable, suburban atmosphere for young people. It's hard to find a better school than Princeton University if you wish to study Physics. After graduation, physics students typically make around $63,295 in the first five years of their career. Located in Princeton, New Jersey, Princeton supplies a safe and sound, suburban atmosphere for learners. Rensselaer Polytechnic Institute is among your top options if you want to study Physics. Soon after graduation, physics students generally earn an average of $60,285 at the beginning of their careers. Placed in Troy, New York, this school is a sound choice for students who enjoy the thrills of a substantial city. It's hard to find a better school than Cornell University if you wish to study Physics. In addition to its bachelor's programs, Cornell University offers graduate degrees in Physics. Ithaca, New York is an ideal environment for college students who enjoy the fast-paced urban lifestyle. Yale University is among your top options if you want to study Physics. Physics graduates from Yale University get a earnings boost of approximately 35.5% above the typical income of physics graduates. The setting in a large urban center is great for students seeking out considerable options for social networking, excitement, and exploration. It's hard to beat Harvard University if you want to study Physics. Physics majors from Harvard University get a earnings boost of approximately 39.9% over the average earnings of physics majors. This school is one of the largest schools in Massachusetts. University of California - Berkeley is a good choice for students pursuing a Physics degree. After graduating, physics students typically earn an average of $59,945 in the first five years of their career. University of California - Berkeley has one of the largest student bodies in California.